Why is it that after a day in the office, I always feel so grimy? It's not like I have a physically active job, but when I get home from work, I'm never feeling fresh which makes going straight out a little challenging. Not that I have this problem frequently-- I can't remember the last time I went out on a Friday night, much less a week night. But last week, we had a good reason to go out for some cocktails and toasting-- Stacy & Eric are engaged! With less than five minutes to refresh, I went to my go-tos... tease my hair, pull it up in a ponytail and pile on the bangles. Gold & White: I think these might be from Forever21 years ago?? 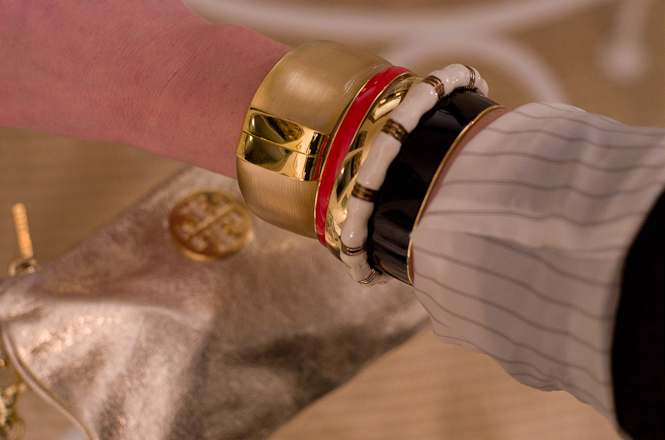 Stay tuned later this week for a round up of some bangles that I'd love to add to my collection.